After some breakfast at the Omni Hotel, we set out to visit the Golden Gate Bridge for its beautiful sights. We are also riding around to visit attractions around the Golden Gate Bridge, such as taking the tour and going to Fisherman's Wharf, a great place surrounded by water. 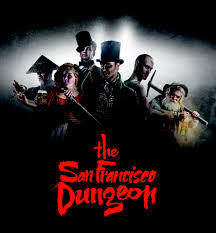 Next, we will visit many rides such as the San Francisco Dungeon, a great amusement ride with a scary backstory. After riding, we will go to Twin Peaks for a great sight at night. Finally, we will take our stay at the Omni Hotel another time. San Francisco Dungeon picture and Golden Gate Bridge's location.